For about a week before this game, I had been planning on going to Merstham v Metropolitan Police, seeing that the club had been offering free entry. But then on the morning of the game I saw that Waltham Abbey v Chesham United was also free to get in. I had no real preference between the 2 games, but I could get my usual companion Anwar to help out with petrol to Waltham Abbey, even though it would add around 20 miles to the journey. I'd enjoy the company as usual and it would help with keeping my costs down as well. I texted him to see if he was up for it, he replied in the affirmative and so I decided to go there. I spent the rest of the day relaxing at home, apart from a quick trip down town with my Dad where I bought some diet Irn Bru for tonight and got completely soaked as the rain was hammering it down. After a dinner of Chilli Con Carne, I left home at 5.45, picking up Anwar in Aylesbury at 6.15. We had an unexpected extra guest in Ben, a good mate who lives in Chesham and who wanted to see his local team play. He is also a man who had made it his personal mission to empty his bowels in as many different football stadiums as possible, an amusing if slightly strange target. We picked him up in Chesham at around 6.40 and were soon on our way to the game. I had seen Chesham United play on several occasions before. My dad has taken me on a few occasions when I first started to get into football. One of the biggest games being v Dover Athletic in the FA Trophy in 1993. At the time Chesham were leading the Isthmian League and Dover Athletic were doing the same in the Southern League. This was in the days before the Conference regional divisions, so it was in effect, step 2 of non league. My uncle is a Dover fan and was visiting us for the weekend. He would have been disappointed as Dover lost 1-0 in front of nearly 2000 people. A few years later it was an easy place to get to on the bus if Wycombe were playing away and I was working. Even when I could drive I went back for a few games as it was quick and easy to get to. 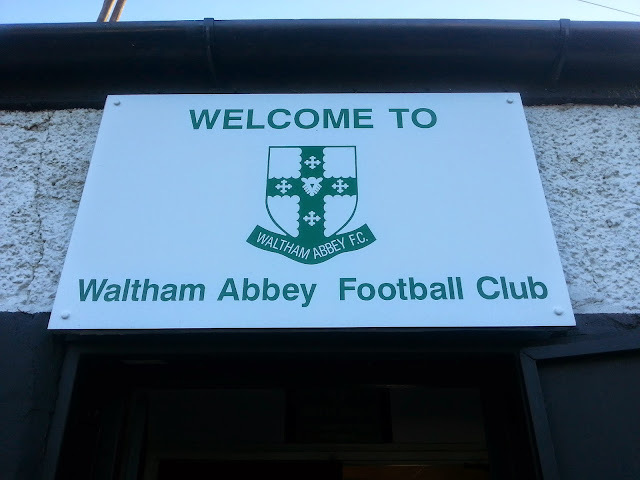 Waltham Abbey on the other hand, were a team I had not been to see. On Non League Day 2011 I went to Bishops Stortford v Boston United at 12.30, meaning I could do another game at 3PM. 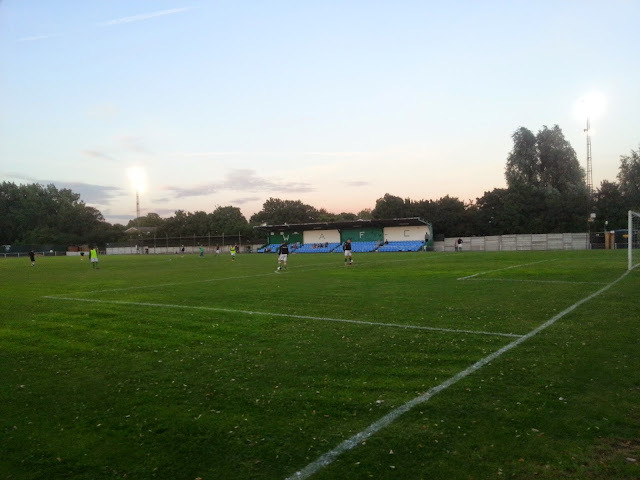 I chose to go to Cheshunt v Southend Manor, which turned out to be an awful game. A few miles away at another game I could have gone to, Waltham Abbey smashed Ware 7-1 and I wished I'd gone there instead. I had been there to take photos in the past though. The ground had looked like it could do with a bit of a tidy up at the time, so it would be interesting to go back and see if it had changed. We arrived at 7.25 after a trouble free journey on the M25 for once. 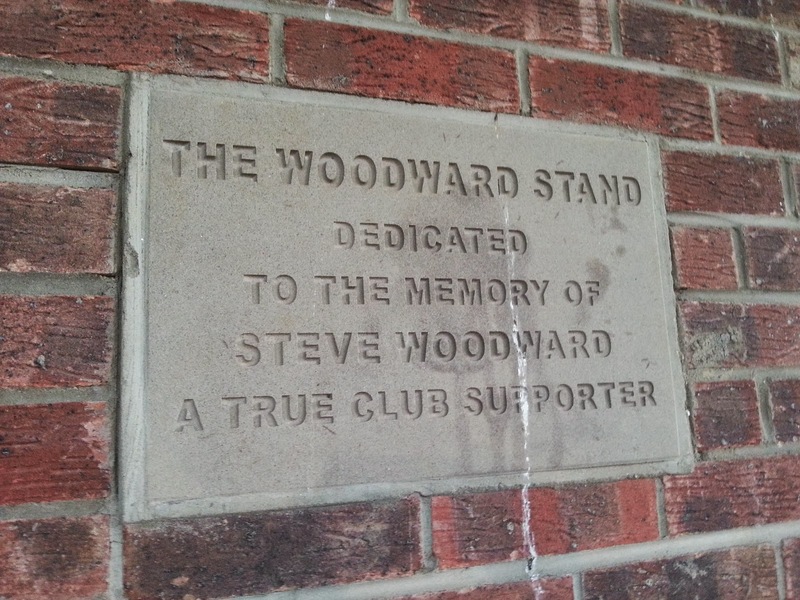 We checked out the clubhouse and then went into the ground and got some pictures. There was no programmes or teamsheets as expected, but it was disappointing not to have any tannoy announcements. I was glad that the free entry was offered as promised and after a grotty day, it was a pleasant warm summers evening to watch football. 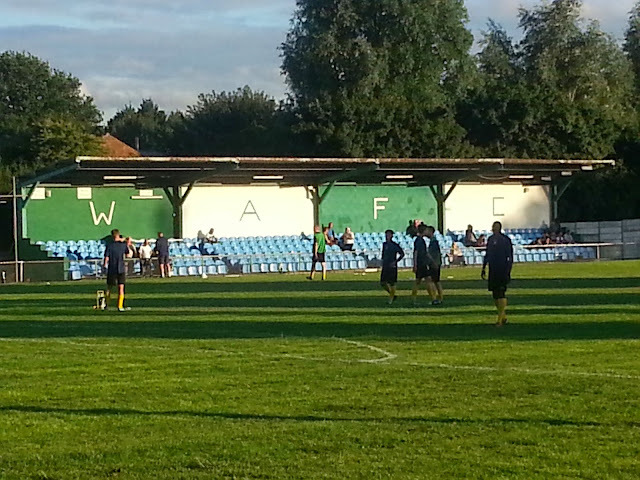 The first half was all Waltham Abbey and they looked to be a really decent side apart from their keeper. It was his mistake that led to Chesham's number 9 seeing his cross going straight in as the glovesman flapped at it. 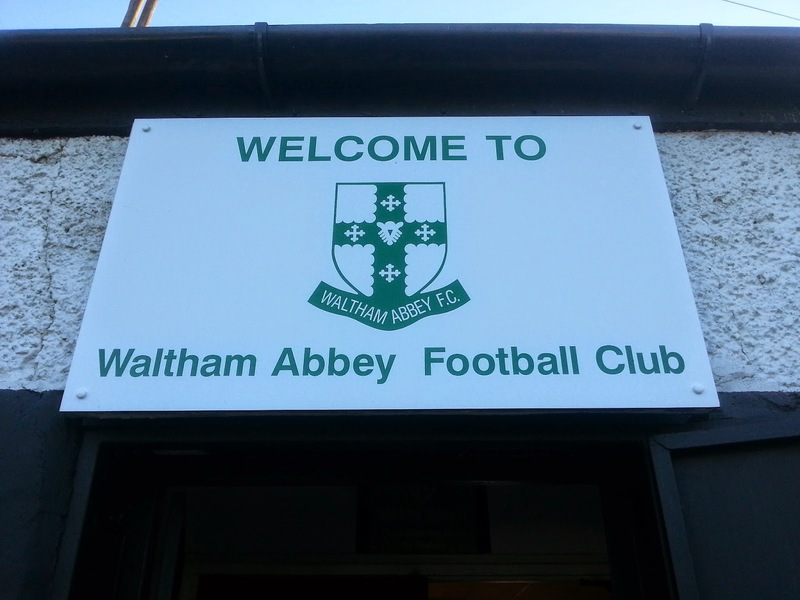 The goal was against the run of play and Waltham Abbey got back on level terms on 43 minutes. A player was felled in the area and from the resulting penalty was put straight down the middle by their number 9. Chesham had a goal disallowed before half time in what was an entertaining first period. 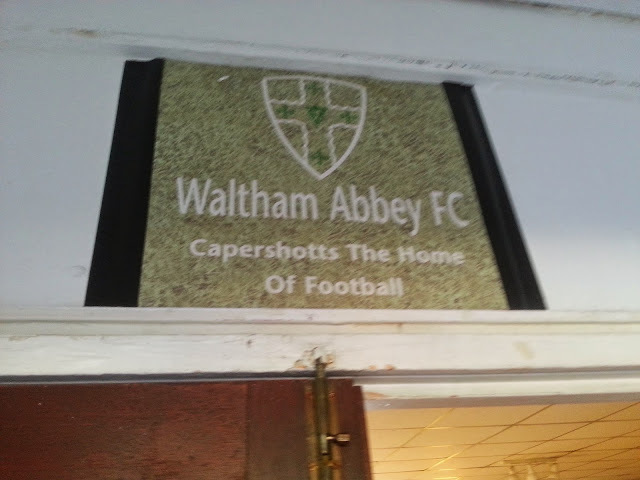 CAPPERSHOTS has been tidied up a bit since I last went to take pictures. It's one of the older and more traditional grounds out there. There are 3 areas of cover. 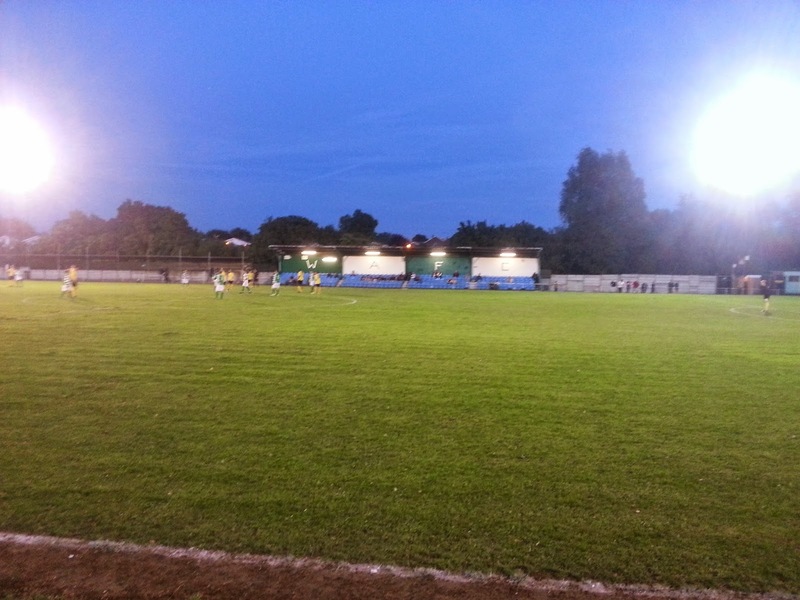 A stand holding around 200 that looks a bit odd with blue seats. I'd imagine that they came from another ground or they got them at a good price. It's certainly something a bit different to the proliferation of pre fabricated metal stands that you see almost everywhere now. The other 2 areas are covered terracing, holding another 5-600. 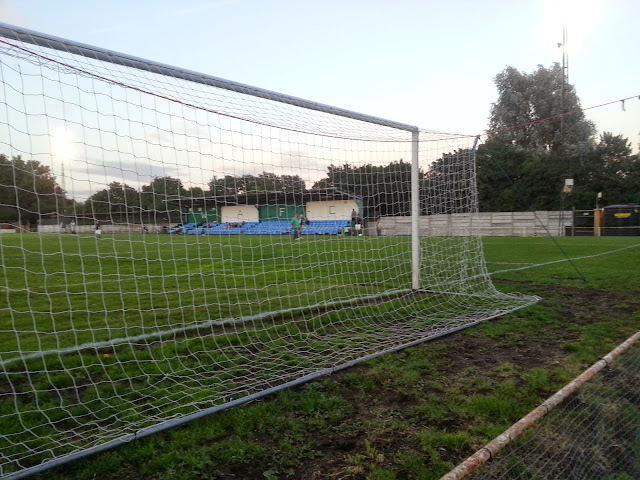 The steps on the one behind the goal are really steep, which is handy for short people like me! 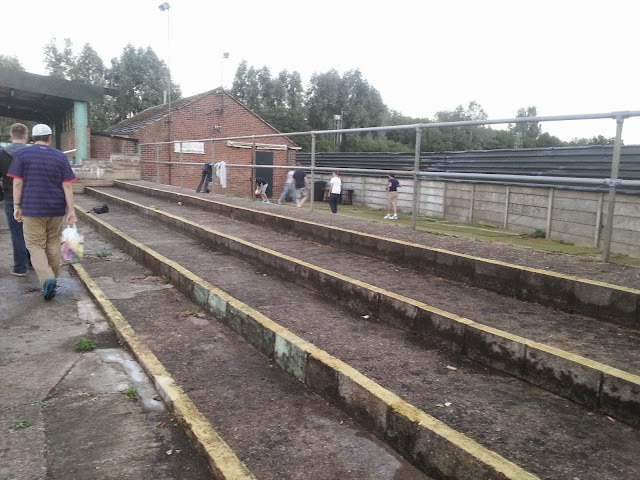 There is further terracing at various points around the ground. There is a pretty standard clubhouse for this level, which has Sky. There is also a small range of stuff for sale in the bar, including keyrings, badges and ski hats. The best thing is the tea bar. 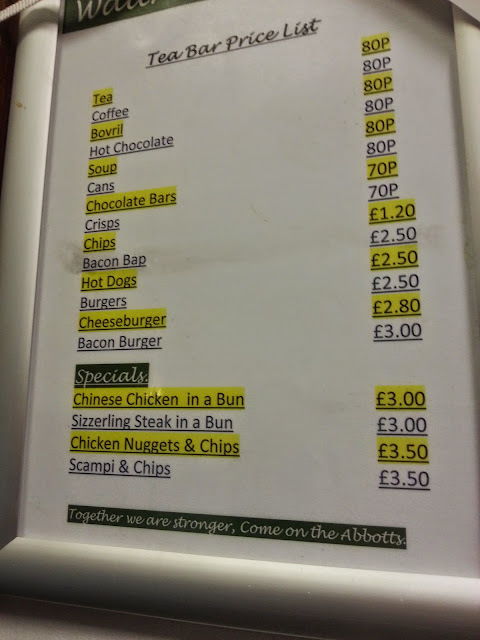 They do a great range of stuff including Chinese Chicken, steak rolls, plus the usual fare. It's nice to see some clubs put some imagination into what they offer. Overall, I'd recommend coming here. The people were friendly and it's a good ground to visit. I think they only get double figures for league games, and there was only around 50 people when I went, despite the free entry. The club deserve better and the local population should drag themselves off their sofas and come down and watch some proper football, instead of sitting and watching footy on Sky.